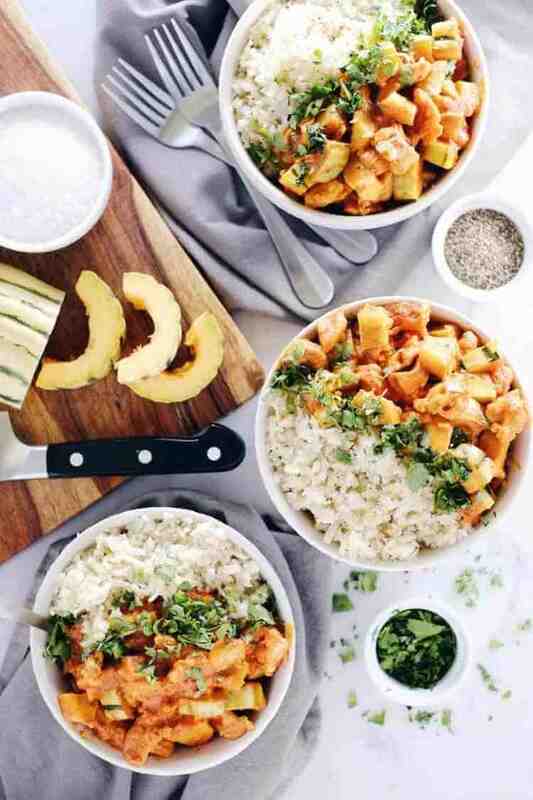 Bowl meals are life for me. Justin doesn’t really get it, but he goes along with it. 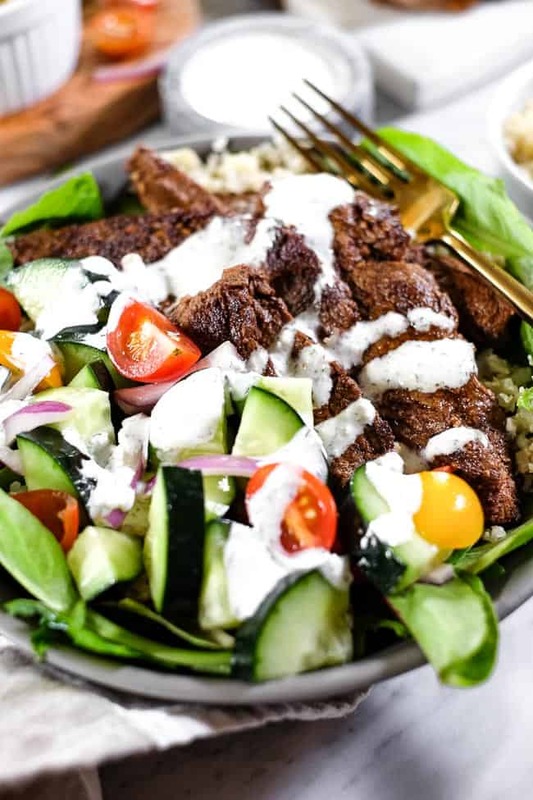 This Paleo, Whole30 + Keto beef shawarma bowl is uniquely flavored and full of all the goods – seasoned beef, spinach, cauliflower rice, cucumbers, red onion and tomatoes all topped with a creamy, dairy-free tzatziki sauce! Usually our recipes have pretty minimal prep, and we try to make lots of them ready in about 30 minutes. This recipe is still about a 30 minute meal, but instead of most the time being spent cooking, it’s spent prepping. It’s easy stuff though. Slice up your beef and marinate it, and then prep the rest of the veggies. The cooking will only take about 7-10 minutes on your stove top. Done and done! 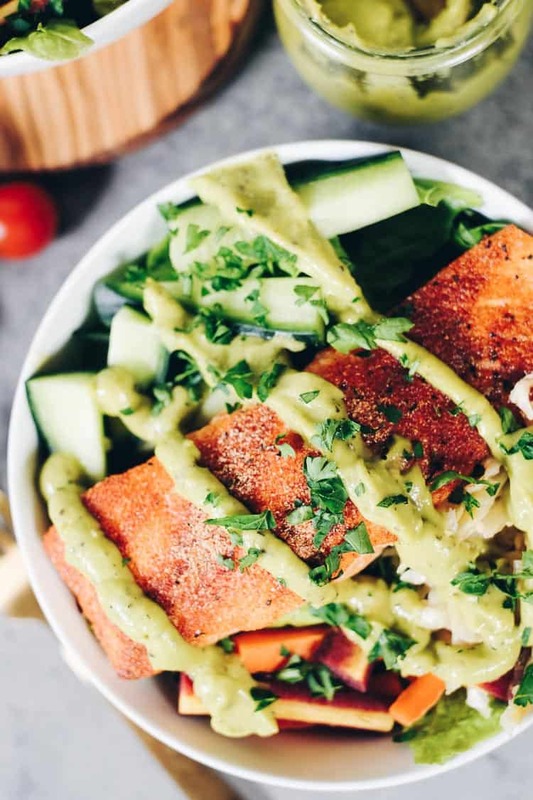 If you’re not yet a sauce person, it’s time to get on board! 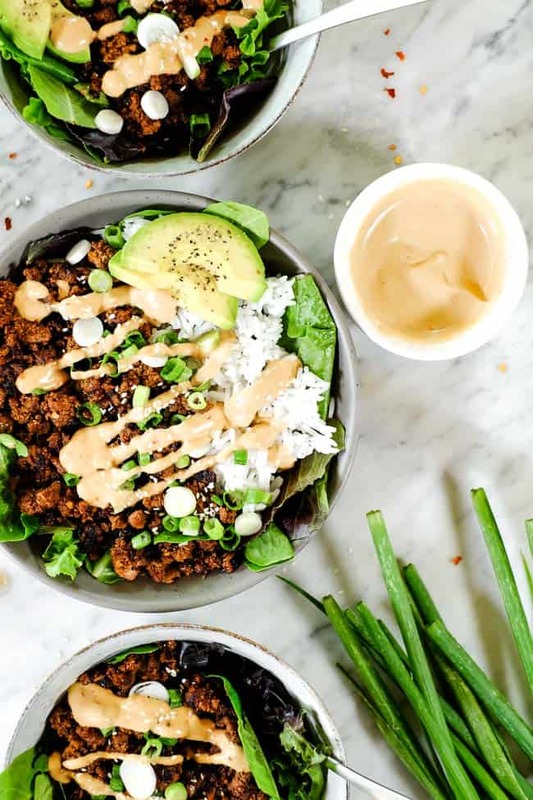 We loooveee sauces, and I especially love them with my bowl meals! They just add so much flavor and fun to a meal. 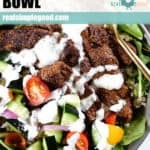 The tzatziki sauce for this beef shawarma bowl can be thrown together while the beef is cooking in your food processor. We just use the recipe for the sauce from our Greek Meatballs. You could also just use some greek yogurt as well if you want to keep it extra simple. 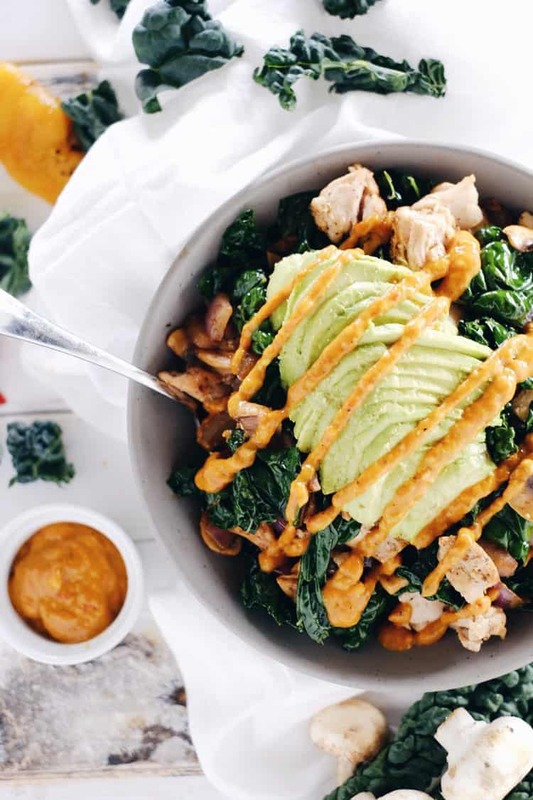 What Is It About A Bowl? 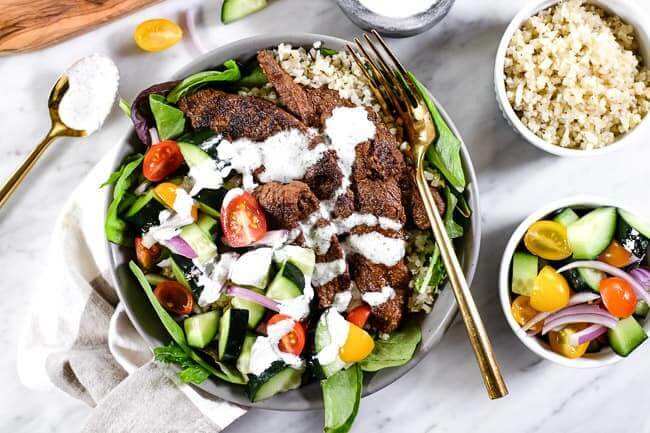 Kick up your bowl meal game with this beef shawarma bowl! 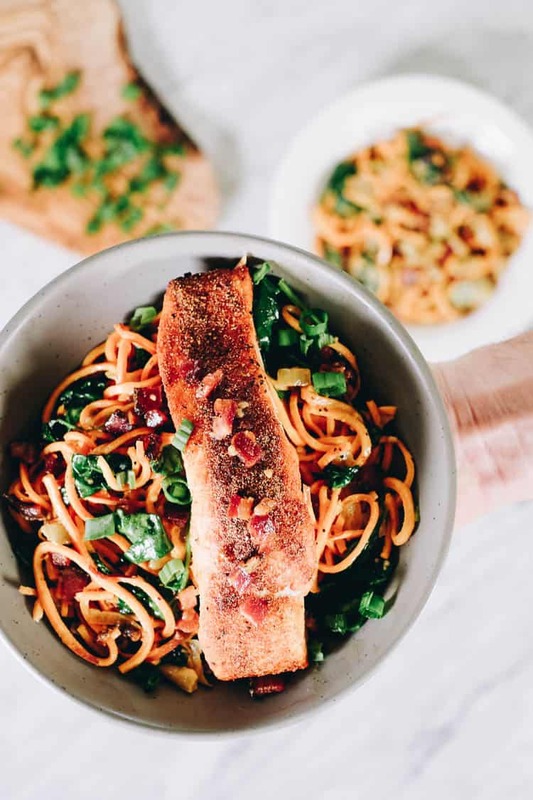 It’s another easy weeknight dinner with unique flavors that will have you feeling satisfied and pretty impressed with your kitchen prowess! Leave a comment below and let us know how it goes. 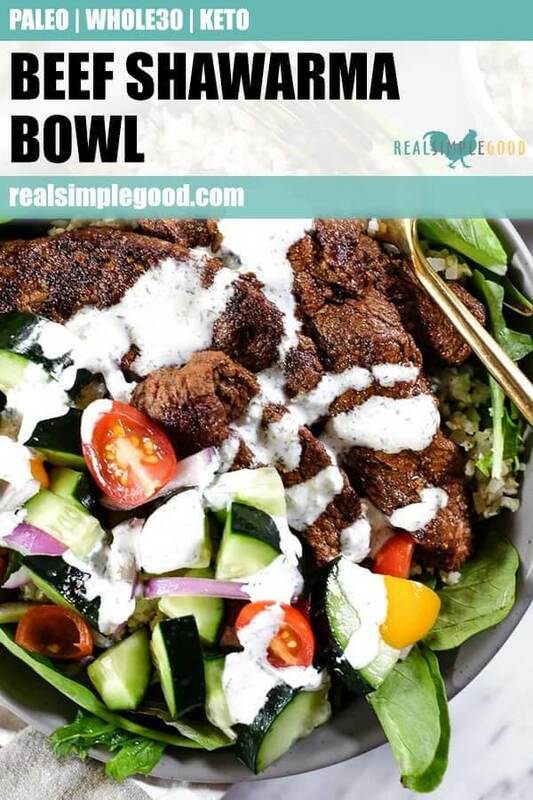 Also, take a pic and tag us on Instagram @realsimplegood, so we can check it out! Give us a follow if you don’t already. We’d love to stay connected! 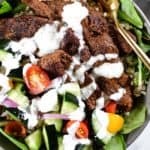 This Paleo, Whole30 + Keto beef shawarma bowl is uniquely flavored and full of all the goods - seasoned beef, spinach, cauliflower rice, cucumbers, red onion and tomatoes all topped with a creamy, dairy-free tzatziki sauce! Slice and marinate beef first. 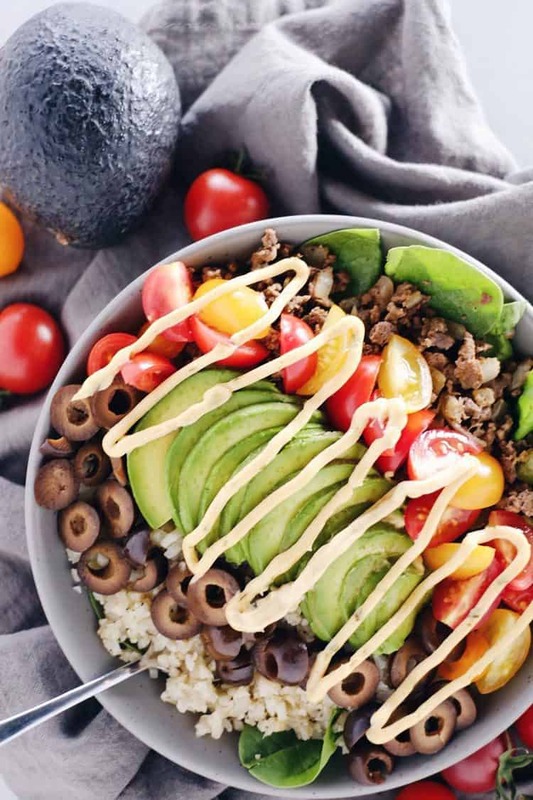 Place sliced beef in a shallow dish and combine with avocado oil and seasonings. Cover and refrigerate for at least 15 minutes. Prep the rest of the ingredients for the bowl as noted above. After beef has marinated, saute in a large skillet over medium heat for about 7-10 minutes, until cooked to your liking. 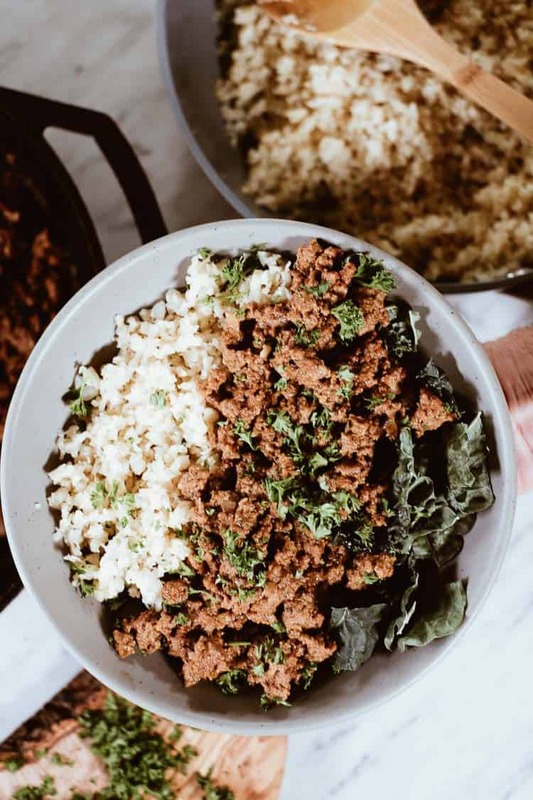 Cook cauliflower rice while beef is cooking. 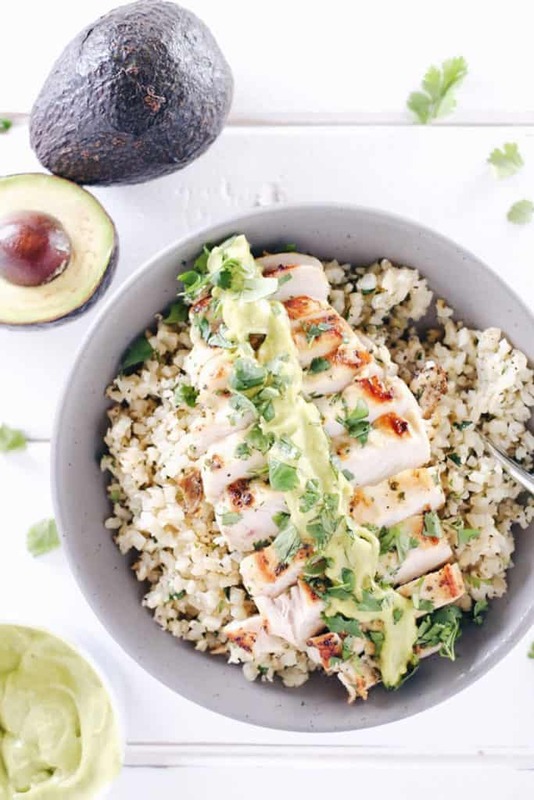 In a medium skillet over medium heat, add avocado oil and cauliflower rice. Cook until tender and season with salt and pepper, to taste. Once beef is done, assemble bowls. 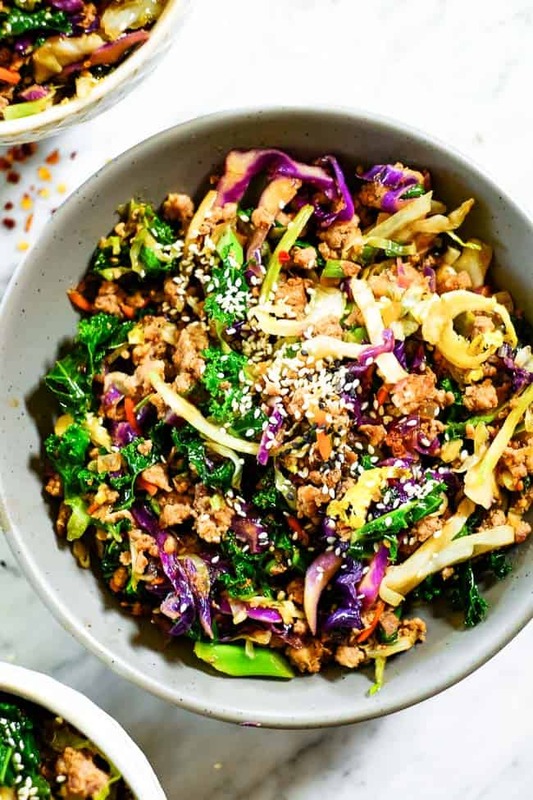 Start with a base of greens, and add cauliflower rice and other veggies. 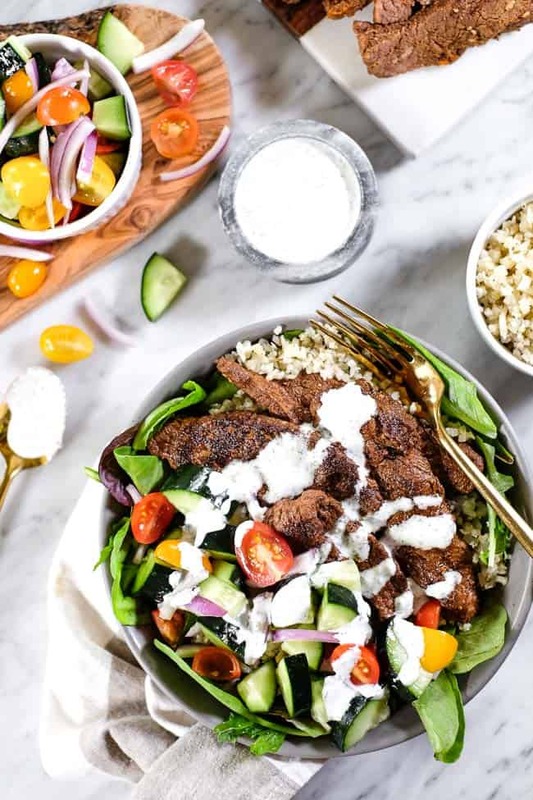 Finish with a drizzle of tzatziki sauce over everything. Enjoy! This was a hit with my hubby. 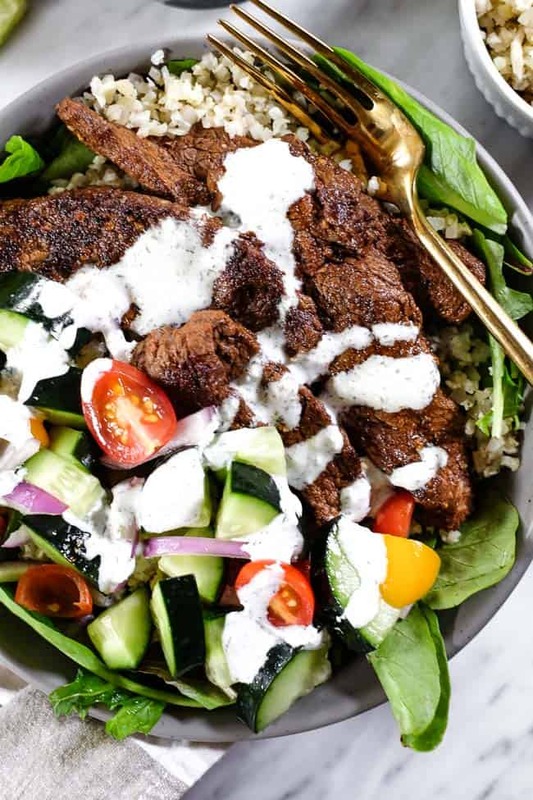 I liked it too but I would prefer less oil in the recipe since we used flank steak it allready had enough fat to it: we served ours over salad & I made the sauce with sourcream & we used it as a dressing. I will definitely make this again with fresh pita bread & some feta. The flavours taste authentic & is restaurant quality. Great job :). Thanks for the review and we are glad you guys enjoyed the recipe!